Like many houseplant enthusiasts, I've tried my hand at growing plants from seed. If you go by percentages, I'm quite unsuccessful, since I've probably sown several dozens of seeds over the years, and I have only produced six adult plants. Four of the six, two Streptocarpus and two Sinningia speciosa (aka Florist Gloxinia) all of which achieved blooming size and flowered, fell victim to the Mus musculus problem we had in our basement a couple of years ago. Gesneriads are yummy to mice, apparently. 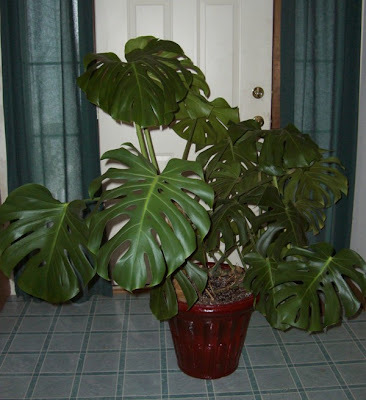 I have also bragged about my seed-grown Monstera deliciosa in the past, particularly on my web pages. Monstera deliciosa. This picture was taken one year and two days ago; the plant is much bigger now, and will probably take over the house some day. By the way, has anybody seen my cat? My Strelitzia reginae. At this stage, it has developed into a clump of six growing points. The plant has had a rough time. 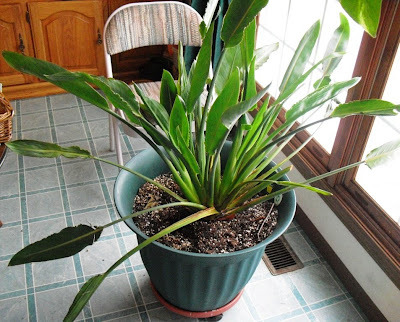 It had spider mites one winter, and I had to cut off several damaged leaves. Then I didn't acclimate it well the following summer when I put it outdoors, and it got sunburned. It took more than a year for the Bird to recover from both these indignities. It certainly isn't the prettiest plant I own, and it may never bloom. But I'm still kind of proud of it. Ha ha...I had to laugh with your Monstera deliciosa comments. I guess it will take over the house one day. And I warn people about letting their pets get too close to one of them. Your bird of paradise is quite lovely, by the way.